All Pirates, All the time. Right!? I'm loving my new Pirate clip art that I got from Scrappin' Doodles. I'm having a blast making activities for you guys with it!!! This activity is chock-full of great, customizable articulation games! To play this game: Throw the cube and see which pirate object you land on. You have three options to play. 1) Whichever object you get you must answer 3 questions to achieve the object (use the pirate ship sheet). 2) You answer the question to get the object. 3) Utilize markers and move one by one depending on what you roll. Once you get the object, place it on your board and you’re one step closer to the treasure! SO, if you roll a pirate hat, you must either answer three questions correctly and fill up your pirate ship OR you must answer the question correctly to get the object. Fill up the board, or reach the end and win the treasure! To prepare this activity: print out the cube and laminate it. Then, print out a treasure map for each student. If you chose to print your own questions for the back of the objects, there is a blank sheet in the pdf (you can laminate on the back of the object sheet). If you chose to play the 3 questions for 1 object way, print out a pirate ship for each student. Here are some more uses! 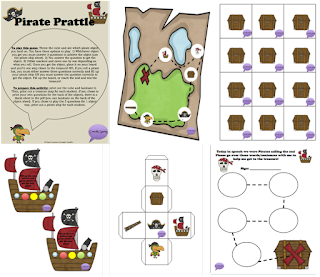 1) Use the pirate ship boards as behavior modification visuals (red, yellow, green behavior!). 2) You can also use the treasure map as an actual treasure map and hide the objects around the room! Have the students hide the objects and describe where they put them for a seriously pirate-y language activity! 3) Use the cube and objects for an "I-have, You have" game. Download this great activity HERE on TpT!